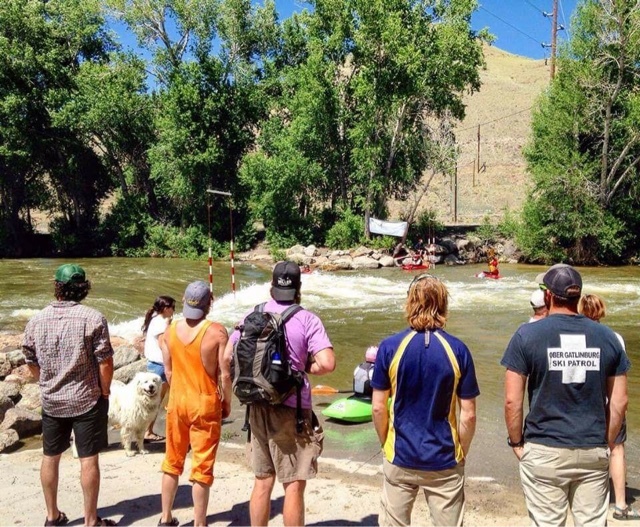 FIRST IN DIRTBAGGIN’ ~ FIBArk 2016 Festival & The Rafting NationalChampionships Coverage! 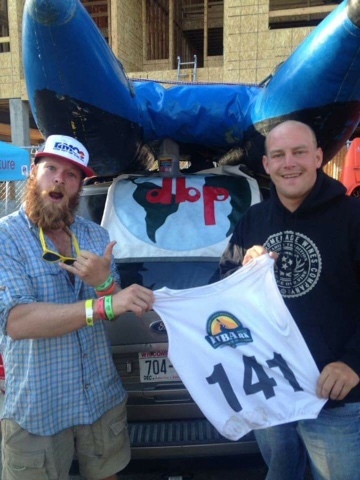 Stories & Photos by Jamie Page & Samantha Hood | DBP MAGAZINE ONLINE The World's Best Free Whitewater Publication. 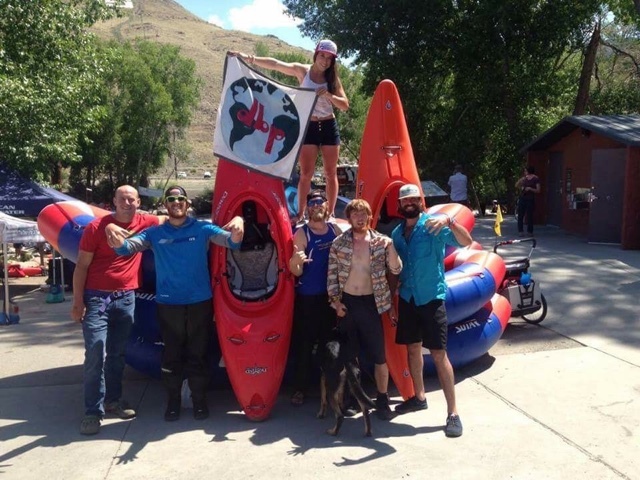 EDITOR’S DESK- We invited our Staff Writers Jamie Page of Team Rage Cage and DBP Admin Sam Hood to cover FIBArk, America’s Oldest Whitewater Festival. 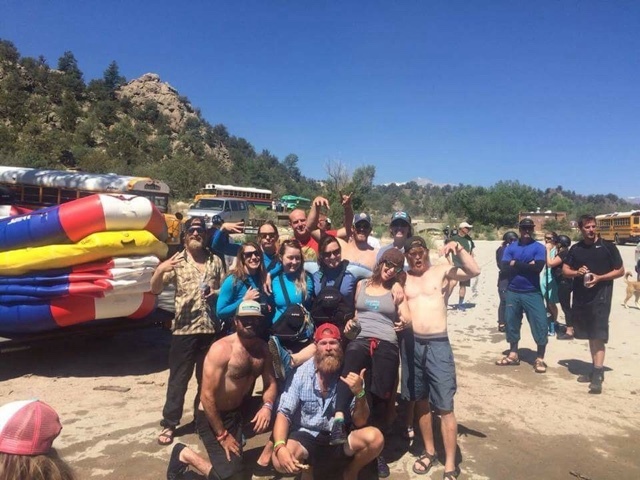 They converged along with many other Dirtbags in June on Salida, CO to paddle and party like only we can, and report back on the good times had by all. Enjoy! A wave crashing in your face as you fight for the next breath. Your paddle strokes containing all the energy you can muster, over and over. The exclusion of all thought besides the next place to be. A head rush of energy as struggling lungs slowly relax. A shared grin with your five teammates. The basic desire to win. Feelings generated by any serious competition are intense, and we had the opportunity to race in a whitewater rafting National Championship! 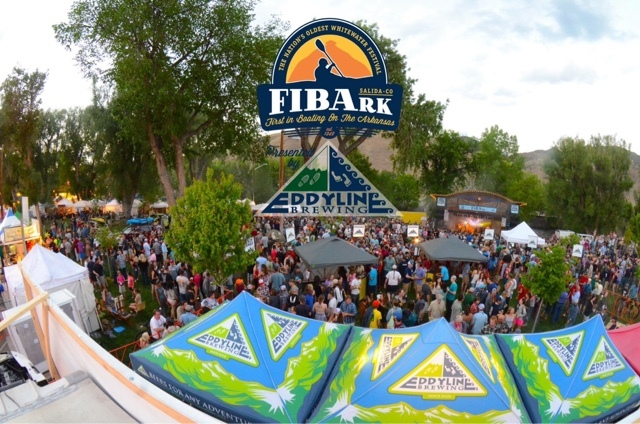 FIBArk is a three day whitewater fair held annually in Salida, Colorado. It began as a ridiculously long race between two friends kayaking the Arkansas River in 1959, and has grown into a full fledged fest with live music in the evenings, vendors selling and representing gear, carnival rides lining the street (closed off for the festivities), and a myriad of easily spectated whitewater competitions in the downtown whitewater park. Team Rage Cage traveled from Hartford, Tennessee to Salida, Colorado in order to compete in the Whitewater Rafting R6 National Championship, which took place over all three days of the festival (conveniently allowing us to participate in most of the FIBArk jamboree as we were competing in the heart of downtown and the fair grounds). I can only offer some of the details, but the whole experience of traveling to, and competing in, an event of that magnitude was incredible. 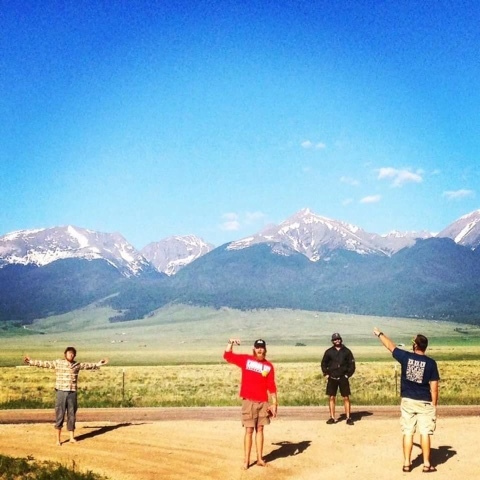 Only with the amazing support from our friends, family, and sponsors like Dirt Bag Paddlers, Hyside Inflatables, Smoky Mountain Outdoors, Whidbey Local, and the marvelous community of Hartford TN, were we able to make it to Colorado. While there, all of the events were exciting to watch, the crowd was welcoming and supportive (especially on the dance floor), and if one wanted to compete there were even amateur events for all abilities. The team arrived a few days early to have some extra time to prepare for the race. 7am Sunday morning we departed from our home in Hartford, driving across the country in the bright red Rage Cage panel van. By Monday’s early afternoon we were setting up camp a few miles north of Salida. By the grace of the Colorado river deities, some old friend raft guides who used to work on the Pigeon river in Tennessee offered to take us down Brown’s Canyon of the Arkansas that very afternoon! Zac Lewis and I brought our kayaks for this purpose; Alex Wilson, Bubby Miller, and Jared Shirley were in a raft with our friend, and two ladies (who were previous Pigeon river guides turned Colorado guides) joined us in an R2. Not only did we have the opportunity to paddle some amazing big water waves (the river was high from snowmelt), the trip served the dual purpose of a scouting run, as we would be racing that very section of river in the downriver event of the national championship. After clean lines and a personal 1st descent was checked off by Team Rage Cage, we turned in early to get some much needed sleep. 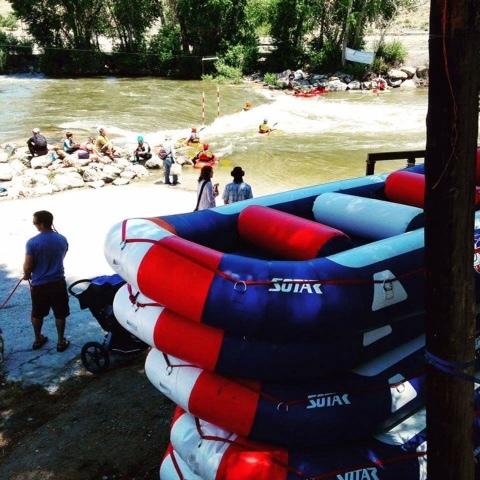 Tuesday was an optional practice day to use the race rafts in the Salida whitewater park. However, the entire group thought that while on an expedition like this, we needed to follow our hearts and go looking for more big water. The Numbers section was the final decision, a class IV-V run with rapids named by consecutive numerals. Since it was high-water there were waves bigger than the ones on the Gauley. It was breathtaking! Almost continuous haystacks for 8 miles with a minimal amount of eddies large enough for a raft. The day ended earlier than intended so a friend picked us up off the side of the river, and he brought beer! Pre-race day Wednesday was comprised of rest, a couple practice runs in the Salida whitewater park, more rest in the pre-festival evening, and a certain mental preparation. Thanks to the Dirt Bags and Aaron Erdrich, Rage Cage registered a vendor site; therefore our van was parked at the boat ramp directly adjacent to the whitewater park. All morning the concrete walkway to the river view was our back porch, with river traffic passing by all day. We passed out Smoky Mountain Outdoor brochures and stickers, shared the giant bag of candy we had with anyone, and goofed around when not practicing in the raft. As it stood, Aaron was stuck in Oregon with a car currently getting repaired, Alex was suffering from knee and shoulder injuries, and we had only been in a raft together as a whole team a couple of times. We go on river trips together all the time, but usually in separate boats like kayaks, R1s, and R3s. Working together as a team in a competition setting presents a very different challenge, especially when there are six people that have to work together at the same time to steer the raft. We watched the sunset from our campsite with the 14,000 ft tall Collegiate Peaks presenting the background, and went to bed early to get ready for the races. Thursday was the first official race day of the national championship! Two events were held to kick off the contest: a time trial and a head to head challenge. All morning was spent in excited anticipation of the racer’s meeting at 1:30pm. Until this time we were only able to meet a few of the other competitors as they randomly passed our van and asked if we were Team Rage Cage. When the all of the participants finally gathered together it was an awesome feeling. In total, there were 14 teams participating. All gathered for the purpose of getting down the river faster than everyone else. The time trial started at the baseball fields upstream of Salida. A few hundred yards of intense paddling through some flat water started the run, followed by the whitewater park in Salida, which consists of 3 big main surf waves with smaller waves in-between (the finish line was just after the only bridge in town). And that was it for the first event. Times from the trial were used to seed the heats for the next events. After a surprising long time waiting for the judges to compile the times, the head to head challenge was next. Comprised of two teams in each heat, each team started in an eddy (slackwater next to the main current), and had to peel out into the current and get downstream faster than the other with non-harmful contact allowed (keep that t-grip covered). The first team we faced was called Green Sage Adventure Outdoors https://sageoutdooradventures.com/ from the Vail area, Colorado, and they were stiff competition. Due to a lack of managerial oversight, we were unfortunately stuck starting in the eddy on river left in both heats, which had a slower exit current than the right side, and therefore were presented with a disadvantage. On top of that, the two teams we were seeded against (Green Sage AO and the Ark Sharks) are from CO, paddle the Arkansas river all the time, and have been together for years, longer than Team Rage Cage. The good news was that our sixth member (Aaron) was finally able to get to Salida and showed up just in time for the Head to Heads. We came in second in both heats, but we met them with enthusiasm and congratulations after the races. The festival night included a really good marching band called Marchfourth! and probably a little too much alcohol with hundreds of people. This was the night that our friend tried a midnight high-water surfing session with Aaron’s raft that turned into a swim, a lost raft, and a raft rescue trip that Zac and I went on until 2am. We weren’t the ones to lose it, but we didn’t come back with the raft. ? Friday was Slalom day. This was the only event of the day, but this race takes careful planning. In whitewater slalom there are two types of gates, downstream and upstream. Green gates are downstream, through which racers need to travel with the current down through the two poles without touching. Red gates require the boat to pass through the poles in an upstream direction, before getting back in the current and traveling downstream to the next gate. If a gate is touched (bumped, pushed, tapped etc) a 2 second penalty is accrued. If a gate is missed completely, a whole 50 seconds are added as a penalty, basically knocking that team out of the running. There is a nice trail next to the river in the Salida whitewater park so the teams were able to scout the whole slalom course. Our first run was a learning run. We learned that we had to do a lot of ducking, diving, dipping, and dodging (as long as the gates were not touched, it doesn’t matter where you are in the boat as you pass it), we learned that bow paddlers needed to draw the boat into eddies, and we learned that we needed more teamwork. Therefore, on the second lap, we significantly improved. All in all we came in 4th in the Slalom event. Our first lap was 3:42:00 with 44 seconds of penalties. Yet our second lap we had a gross time of 3:15:00 and only 30 seconds of penalties. We felt the improvement on our second lap, got super stoked about it, and I think this was the moment that Team Rage Cage started to really perform. Friday’s festival scene felt like the calm before Saturday’s storm. Peter Rowan and friends were the music entertainment, and while musically gifted, they didn’t quite stir the crowd with calm bluegrass country. Team Rage Cage didn’t get too rowdy as our final competition would be in the morning. All teams were to meet at Hecla Junction early Saturday morning, the take out/finish line for the downriver race event. We were only camped 1.5 miles away so we woke up at 7am, blowing up boats, with a drive to the put in, a short float down to the starting line, and a simple mass start to get everything underway. Brown’s Canyon National Monument is an incredibly beautiful stretch of river. It’s not wild and scenic; houses and a train track are visible, but especially in the gorge section, the whitewater is excellent with big waves and the background is beautiful. Paddling as hard as you can for five miles down a snowmelt-cold river is definitely a great way to wake up in the morning. After the start we fought for and held a steady 4th place for the rest of the race; however, in between strokes, I could see ahead and watch the two best teams in the country (the Ark Sharks and 9 Ball) battle head to head for the entire 5 miles. When whitewater racing there are fast places to go on a river, and there are slow places to go on a river. The goal of a downriver race is to link the fast lines from rapid to rapid, and even in the flat moving water. Charging downstream, paddling as hard as possible, while trying to finesse the boat onto the fast water without hitting the slow water is incredibly challenging, and even more so when you have to coordinate between six people. We kept the leaders in sight the whole time, and we maintained the 4th place position the whole race to eventually land us the 4th place spot in the overall standings. At the finish line all of the teams shook hands, drank some beers together, took a group photo, and started working our way to the festival to get some real drinking done now that the races were over. I took that time to start working as I preferred to enjoy the now-legal plant rather than risk the after effects of alcohol. That afternoon the awards ceremony was held next to the whitewater park in Salida. There wasn’t a major crowd, mostly the teams and some friends, but all were in good spirits for completing the challenges and there was not one flip in the races. 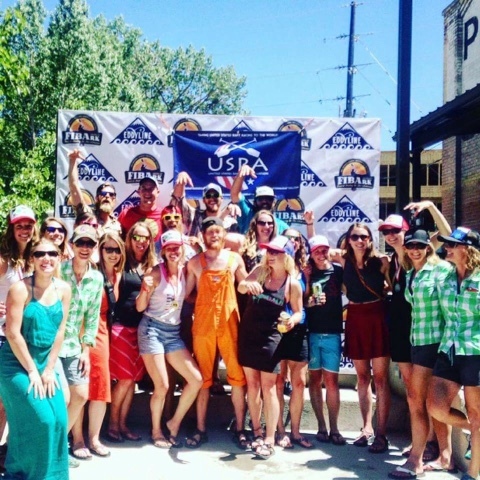 The women’s 1st place team (and now Team USA) is called the Colorado Women’s Whitewater Rafting Team. The 1st place mens, and now also Team USA, is team 9 Ball. Team Rage Cage came in 4th in the nation! It was such an exciting event that we want to compete in more races and at FIBArk again next year. To be honest, I believe that Rage Cage had a large contributing role in the positivity of the whole national championship. We arrived with the intent of sharing the idea of Team Rage Cage, that everyone can be a member of our team. You just need to follow your passions, be yourself, and be down to rage when the opportunities present themselves. After each race we would make sure to high five our competitors and congratulate them on a good race, win or lose. For the ones we could spectate, Team Rage Cage would cheer the loudest for the competitors. I’m also 98% certain that we got the loudest cheers from the spectators on the side of the whitewater park. After each race when the endorphins were firing it was our plan to bring a little fun back into the races by spreading sportsmanship. Additionally, I truly appreciated the opportunity to spectate on all of the other competitions in the park. There were freestyle kayak and canoe events from novice class to expert (when kayaks do tricks in the wave), slalom kayak and canoe races through town, there was a freestyle SUP competition, and there were hundreds (if not thousands) of private and commercial whitewater boaters playing around. With the addition of the thousands of individuals attending only the festival it was an incredible happening to be a part of. I would highly recommend attending any whitewater festival based on the fact that the whitewater community is a trustworthy one. I hope that you, the reader, will go to a festival like this if you have not already. Check out the official FIBArk (“First in Boating the Arkansas”) website, or like their Facebook page, where the first photo in this article, shot by Chris Miller at the 2014 festival, was posted. Between whitewater shenanigans, Thai sticks, gyros, and plenty of Eddyline beer, there’s not much more that could make me smile. This has been my second time at FIBArk and once again it did not disappoint. The food was delicious and affordable. The gyros are a must when picking what to eat. Saturday night the concert was… well, there aren’t many words that could explain the awesomeness. Robert Randolph killed it all night long! My friends and I stood standing in the crowd cheesing all night long, and it wasn’t just my KODI family that was loving the tunes. Companies from up and down the Arkansas Valley danced the night away. One of the most beautiful things about this whitewater festival is seeing so many whitewater enthusiasts from all over, not just guides from the valley. This time last year the river was way too high for some of the events that FIBArk held. So this year was super exciting because the Hooligan race would go on! It was spectacular. I stood on river right, looking around me and across the river, seeing nothing but people watching and waiting. It’s so neat looking at what these rafters come up with for crafts and costumes. All of the boats were very creative and all tried their hardest to give the crowd excitement. I’m so grateful to have attended this festival twice now, last year as a visitor out for the first time, this year as a local dirtbag, and I’ll look forward to it every year. 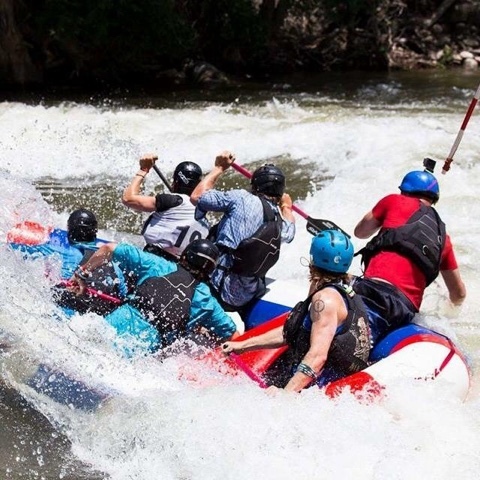 I love FIBArk so much, and urge every other whitewater boater to get to Colorado and check it out for themselves, because this article will never do justice to how wonderful this little town Salida is. FIBArk truly makes a rad weekend for all my whitewater friends. 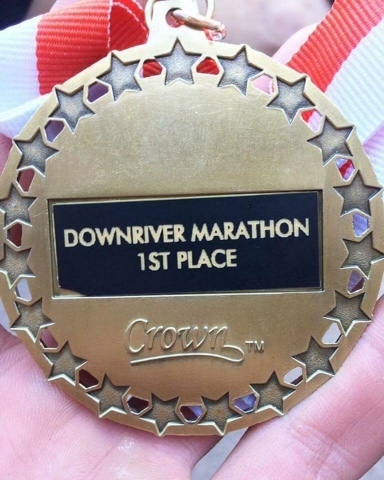 Also big shout out to Chas Branson for taking 1st place in the downriver race!